WORCESTER, Mass. 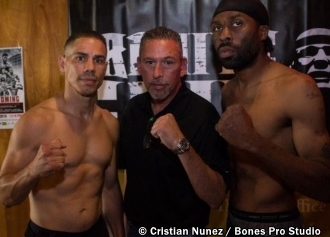 (August 17, 2018) - The official weigh-in was held today at Grille 57 for tomorrow night's "Homecoming, presented by Granite Chin Promotions in association with Rivera Promotions Entertainment, at The Palladium in Worcester, Massachusetts. "El Gallo" Jose Antonio Rivera (41-6-1, 24 KOs), Worcester, MA 159 lbs. Larry "Slomoshun" Smith (10-37-1, 7 KOs), Dallas, Texas 155 1/2 lbs. Kendrick Ball, Jr. (9-1-2, 6 KOs), Worcester, MA 162 lbs. Fabian Valdez (2-3, 0 KOs), Cananea Sonora, Mexico 171 lbs. Khiary Gray (15-4, 11 KOs), Worcester, MA 154 lbs. Antonio Chaves Fernandez (9-33, 4 KOs), Brockton, MA 153 lbs. Wilfredo Pagan (4-0, 2 KOs), Southbridge, MA 150 lbs. Engelberto "Guarura" Valenzuela (11-14, 3 KOs), Agua Prieta, Mexico 156 lbs. Joshua Orta (pro debut), Springfield, MA 129 lbs. Edwin Rosado (1-7-1, 1 KO), Worcester, MA 132.6 lbs. Eslih Owusu (pro debut), Worcester, MA 149 lbs. Bryan "The Brick" Abraham (6-30-2, 6 KOs), Schenectady, NY 148 lbs. Jose Angel "KO" Ortiz (4-1-3-1, 1 KO), Springfield, MA 159 lbs. Patrick Leal (0-4), Somerville, MA 156 lbs. (anthoneerivera@gmail.com/774.272.2269) or any of the fighters. OTHER: Event sponsors include Lundgren Honda, Elm Wealth Group, Atty. Maria M. Rivera-Cotto, Championsofhealth@USANA.com, Chieftain Liquors, Centro Las America, Baystate Savings Bank, Pamela Laporte Realty, Worcester Vocero, ChrisFIT Xperience and Grille 57 (hosting the official weigh in and after party).